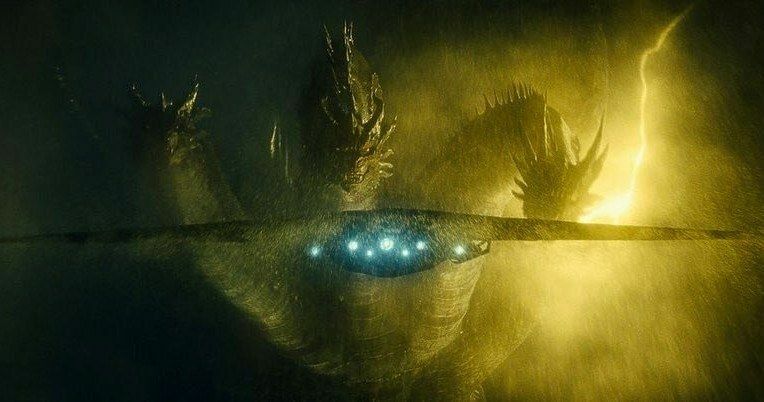 We have a brand new image of Ghidorah from Godzilla: King of the Monsters. It's been a long time since Godzilla last graced the big screen in the States, as we're coming up on five years since Gareth Edwards' 2014 movie introduced us to this new version of the legendary monster. But this year will finally see his return, alongside a trio of other classic Toho monsters, including the fearsome, three-headed King Ghidorah. Now, director Michael Dougherty has shared a brand new, epic image of the beast for us to check out. Michael Dougherty shared the new photo of King Ghidorah on his personal Twitter account and the beast is emerging from an all-black background, with yellow lightning crackling around him to reveal his terrifying, hulking shape. It's pound for pound one of the best looks we've had at the creature yet. Dougherty also decided to caption the photo with some cryptic text, just to help set the mood. "And upon his heads the name of blasphemy..."
The other very important thing we see in this photo is a giant ship, which wasn't identified by Michael Dougherty, flying toward the monster. Our best guess? It's something humanity has cooked up to try and level the beast before he levels the world and claims his place as king. In the comments section on Twitter, some theorized that it might be a new version of Super X, a ship from the classic Toho movies that first appeared in The Return of Godzilla and is used to help defeat these giant monsters when the time calls for it. Though, for now, there's no confirmation on that front. Either way, we're guessing Ghidorah is going to get the better end of that encounter. Godzilla 2 is also going to introducer Rodan and Mothra into the mix, marking the first time that these classic monsters are being reimagined for American audiences. It also means this movie is going to be absolutely loaded down with giant monster action. Unlike the previous movie, which largely subverted the action, this is going to be an all-out monster brawl. The human cast sees returning members Ken Watanabe and Sally Hawkins, to go along with newcomers Kyle Chandler, Vera Farmiga, Millie Bobby Brown, Bradley Whitford, Charles Dance, Thomas Middleditch, Ziyi Zhang and O'Shea Jackson Jr. Michael Dougherty co-wrote the screenplay with Max Borenstein and Zach Shields. This movie will ultimately help tee up next year's Godzilla Vs Kong, which recently began filming under the direction of Adam Wingard (Blair Witch) and will see the rightful king throwing down with the new version of King Kong that we first met in 2017's Kong: Skull Island. But first up is Godzilla: King of the Monsters, which is set to arrive in theaters on May 31. Be sure to check out the new image of King Ghidorah from Mike Dougherty's Twitter account below.